Welcome to Spinning Numbers! Learn about electricity and electrical engineering. Want to help translate Circuit Sandbox into other languages? It’s easy! Become familiar with the most important electrical quantities: charge, current, and voltage. Circuits are made of resistors, capacitors, inductors, and power sources. Resistors in series and parallel, the voltage divider, delta-wye resistor networks. Kirchhoff’s Laws, node voltage method, mesh and loop current methods. Linearity and superposition. Source transformation. Thévenin and Norton equivalents. Natural response is what a circuit does with its own internal stored energy. If we limit signals to only sine waves, we get AC analysis based on complex exponentials. The operational amplifier is the building block of analog electronics. Using a diode in a circuit. Electric force is described by Coulomb’s Law. Electric field. Formal definition of voltage. Basic concepts underlying digital hardware design. Where does the name Spinning Numbers come from? Tips on the best way to print articles from Spinning Numbers. List of everything on Spinning Numbers. Topics, articles, videos, images, and on and on. These videos and articles began at Khan Academy where I had the honor of being the Electrical Engineering Content Fellow in 2016. The concepts are explained at the level of an undergraduate EE student. Motivated middle school and high school students can get a lot from the course. I set up this Spinning Numbers web site after completing my KA fellowship. I’ve reviewed and significantly improved all the articles, and added several new articles. A nice new feature is the Circuit Sandbox simulator. You will find simulation models included in most articles, to let you try your hand and bring the concepts to life. Good luck as you learn about electronics and electrical engineering. Please leave a comment if you enjoy your visit, and ask questions. I’m here to help. If you want to download an article as a .pdf file, see these instructions: https://spinningnumbers.org/printing.html Is that what you are trying to do? Robert - I think your circuit is okay. You described a circuit with a 3V source in series with 1k, 3k, and 2k resistors. You are getting mixed up between “node voltage” with “element voltage”. An element voltage is what appears across a single resistor. 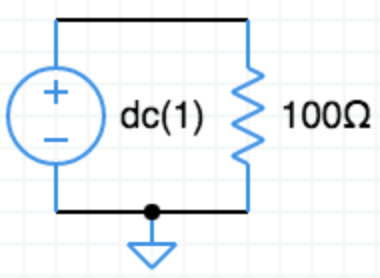 A node voltage is different—it is measured between a node and ground. Here is the definition of node voltage: https://spinningnumbers.org/a/node-voltage.html#definition-node-voltage. The current in the circuit is 0.5mA. The element voltage appears across a resistor. The 1k resistor has an element voltage of v = i R = 0.5mA 1k = 0.5V. One end of the 1k resistor is at 3V with respect to ground (because it is connected to the source). The node at the other end of the 1k resistor is at 2.5V with respect to ground. That’s the node voltage at that point in the circuit. Simulators work with node voltages.